There is something about Thursdays that feel me with hope and renewed energy. Maybe it is the fact that this day occurs on the eve of my weekend or maybe it’s because my calendar usually has limited engagements on Thursdays. Whatever the reason, I like Thursdays. Today I am introducing my first collaborative book recommendation of the month. The book I chose is Act Like a Success, Think Like a Success by Steve Harvey. Before you shake your head in wonder at what a comedian can tell is about success, let me tell you a little about the author. Steve Harvey is a true rags to riches success story who has pulled himself out of homelessness and into wealth. As most stories of success go, there were many failures and detractors along the way. But he made it through and now this book is here to act as a literary life coach providing us with reinforcement to move forward towards our dreams. Act Like A Success, Think Like a Success can be checked out from your local library, borrowed from a friend, or purchased through Amazon, Barnes & Noble, and any local retailer. I am looking forward to not only reading this book but making progress on my own goals for this year. As part of my preparation for the New Year, I decided to create a new tradition – purchase journals to jot down memories of importance to me. These memories will be blessings/gratitudes, quotes, funny things my kids say, lessons learned, podcast sayings, answers to questions for self-reflection, etc. Now this decision was not one that was made in the spur of the moment or on a whim. It was one, I gave a lot of thought into. I am not known for keeping up with one journal – I have many and they each have no other purpose but to be the holder of whatever it was that required me to reach for pen and paper. But they are all very pretty. Needless to say, this system has not been much of a benefit to me. My mom always told us that if we want to get different results we need to do different things. 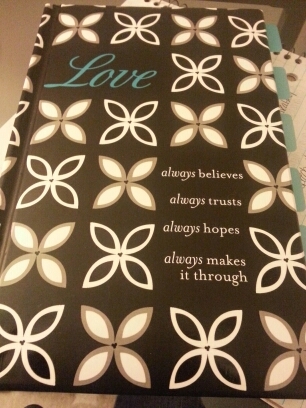 So this year, I was determined to do only one new thing – purchase a pretty journal. I purchased mine right after Christmas and even included coordinating tabs to divide the journal into sections. I made the decision to include all the note taking not associated with my full time job in this one place. And at the end of 2015, I plan to review the lessons I have learned and the blessings I have received and given. In this way, I will have a tangible example of my accomplishments rather than tarnished memories of shoulda, woulda, & couldas. What about you? Any plans to start a new tradition instead of a new resolution. I would love to hear about them. Happy New Year. Let’s make this year one of inclusion and development. This is the year to focus on our blessings and make subtle improvements to ourselves. Enjoy this new year!